Break out the box of wine and the leftover Halloween candy, people. We’re celebrating! Remember how I’ve been working toward running a 5K since . . . gulp . . . February? Today I got so, so close—I took only one two-minute walk break in the middle. I’ve been worried about being really ready for the Hot Chocolate Run in just a few weeks, and was madly googling my problems with breathlessness and frequent walk breaks. Turns out, this borderline anemic girl does much better with iron supplements and green smoothies. Breathlessness, begone! Now my legs are just sore. Ouch. Because they’re actually running A LOT MORE. Also, I read something that said to run at a pace where you feel like you could just go forever. And I nearly snarfed. Doesn’t exist, I thought. But it does—it’s just WAY slower. Like, don’t you dare look at anyone else’s running speed. They have longer legs than you anyway. That slow. But then I really, really can just go without having to stop. And it’s excellent. Truly. I am well aware that people do marathons and triathlons and unicycle rides from Vermont to D.C. and stuff like that. But for me, Hell Yes This is a Big Deal! I’m still dragging around 20 pounds of extra weight, and I’m squeezing in a few runs a week between building my freelance business (going great, thanks for asking! ), raising two beautiful crazy people, and occasionally making eye contact with my husband. So c’mon and break out the Almond Joys you’ve been saving, and spring for th e new episode of The Good Wife on Amazon. (It should be illegal to watch that show without a glass of red wine at least as big as Alicia’s.) No better way to celebrate the Almost-5K than a marathon of couch-potatoing! Actually, there’s one better way. 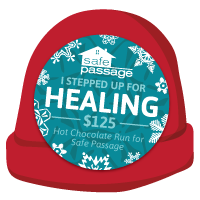 You can donate to Safe Passage, the incredible organization behind the Hot Chocolate Run, creating safe havens and real change for survivors of domestic abuse. You can donate through my Hot Chocolate Run fundraising page. 5K is about 3.107 miles. May I suggest $31.07? or $5? Any amount is awesome, but I have to confess, I really want the hat. It’s going to be wicked cold, and if we raise $125, I get the snazzy hat and really look like I know what I’m about, doing hamstring stretches in the crowd at the starting line. I totally promise to post a picture of me wearing the snazzy hat if we get it. Tomorrow I’m going to be creaking around, popping Advil and swearing, but tonight I’m proud. Let’s go with that, shall we? P.S. Hot Chocolate Run trivia – how do you make 500 gallons of hot chocolate for 6,000 people??? I used to say that I only ran if someone was chasing me. One of my fiercest childhood friendships was cemented on the track in junior high gym class; Amy hated the forced march around the track as much I did, so we joined forces to create an imaginary world in which I was Midnight and she was Blade. We needed to escape the reality of running so badly we created new gang-banger identities. So, yeah, you wouldn’t call me a runner. But when I saw my 40th birthday looming on the horizon, I started to look around for a structured way to meet some kind of fitness goal—any kind of fitness goal, since I was carrying 30 pounds of extra weight (still workin’ on that) and I had never really been able to jog a mile. In my 20s I smoked, drank beer, ate junk, and seemed to bounce just fine; in my 30s I quit most of that to have babies (thank you babies! ), learned to eat veggies from the farmshare, and still put on a middle (thank you babies!). The 40s were obviously going to require (gulp) exercise. And I knew that for me to exercise, there had to be both structure and fun involved. In January I bought a jog bra and downloaded a Couch to 5K app. This is the part where I sing the praises of the Y, the blessed YMCA where my husband exercises regularly, my kids swim and bound around the gymnastics apparatus, and I can tuck them happily into Child Watch while I work out (or, yes, sometimes whip out my laptop in the hallway and meet a deadline). That, my friends, is the only way a freelancing mom like me—who’s trying to keep her childcare bill down to just three days a week—can squeeze in exercise without sacrificing precious sleep time on either end of her day. Glorious Child Watch. I planned out three workouts a week. How does one hurdle past excuses? I don’t know how to work the treadmill and I’ll look like an idiot. I don’t have the right socks. I might hurt myself. My earbuds will fall out. I’ve always hated it. Somewhere in the middle of a grueling New England February, I needed a change so badly I finally climbed up on the treadmill and opened the app. Life is full of detours, but if I think of them as interruptions instead of derailments, they’re easier to take. It’s August. I should totally be running a 5K by now, according to my beloved app. But yes, there were weeks I didn’t run at all, and few nasty spring viruses that interfered, and the end of the school year, and . . . I would just repeat the last week of workouts and build back up again. For my birthday in June, I bought myself new running shoes. And then I got stuck. I was running 10 and 12 minute intervals, and my workouts were taking me over about 2.5 miles. Getting close to the 3.1 miles of a 5K race. But I was conserving energy and jogging slowly to keep going over those longer stretches, and it suddenly wasn’t fun. And I knew that, for me, unfun would prove deadly to my exercise efforts. Somewhere in there, I had discovered the runner’s high was real—I had grown to love that feeling of dialing up the speed on the treadmill when it was time to run, and cranking it up higher during the really rocking parts of my favorite songs. I could count on the endorphins to light me up. You know what’s more fun than jogging? Running fast. How did I forget something I knew when I was five? I put away the app and starting running to my playlist. When the music says walk, I walk. When it picks up, I jog, and when it blasts, I sprint, stretching out for as long as I can go. I’m happy to report that the joy is restored to me; in the mirror across from the treadmills I caught myself grinning. 30.5 mins – how far this time? New goal: 5K in December, with a smile on my face. If you exercise, how do you do motivate? If you have a playlist, what’s on it? 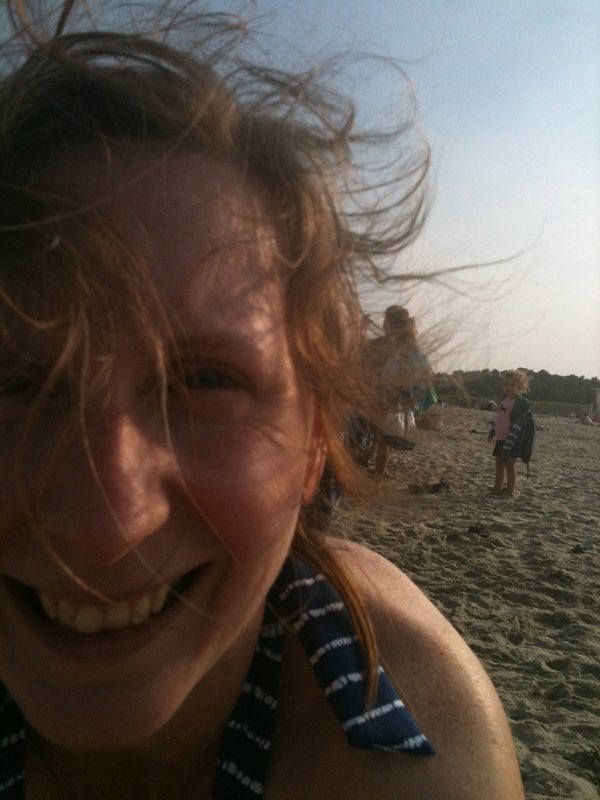 I write about food, parenting, comfort, crisis, books, artists and makers, feminism, and indie publishing, among other things.